(Bloomberg) -- Don’t expect good news from the impending earnings of European stocks, but at least the trough in forecast downgrades is almost here, according to strategists at Barclays Plc. First-quarter results will likely reflect the recent soft patch in economic activity, and coupled with cautious corporate outlooks, stocks could fall back, strategists led by Emmanuel Cau wrote in a note Wednesday. But while negative earnings-per-share revisions will likely carry on in the second quarter, Barclays expects the pace of downgrades to ease as macro data start to bottom out. Improving earnings expectations would be a fillip for a supercharged equity rally that’s in search of catalysts to move another leg up. While dovish global central banks and stock valuations battered by the sell-off late last year have buoyed stocks so far, economic momentum has slowed, fueling concerns disappointing profit growth will drive another pullback. First-quarter earnings are likely to contract by 2 percent in the U.S. and Europe, thanks to weaker manufacturing and trade activities, Barclays says. Currency weakness may help in Europe, while dollar strength will be a headwind in the U.S. The bar for positive share reactions is also higher now that the market has rallied so sharply. On the bright side, earnings estimates have already been revised downward and economic data appear to be improving, the strategists said. 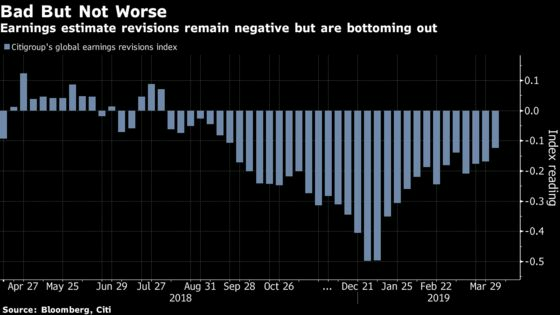 Both Citigroup Inc.’s indexes tracking global economic surprises and earnings revisions remain in negative territory but are at least rebounding. “Expectations have been sharply lowered and we advise investors to look through the near-term earnings volatility as activity momentum is showing signs of stabilization,” they said.